A while back I sent Mr. Q off to purchase this dresser via Craigslist mainly for its mirror harp, which I took off and am keeping because it’s amazing (you’ll see it tomorrow). But even though I was mainly interested in the mirror, I also thought the dresser itself was pretty fab. Here is the ‘before’ photo, which doesn’t include the mirror, but it does include the ‘hanky drawers’. Hanky drawers are those two little drawers, or in this case hinged boxes, that are sitting on top of the dresser. They were meant to store handkerchiefs back in the day when people actually had such things. I generally remove hanky drawers. Much like mirrors, they tend to limit the use of the dresser. And without the mirror, they look kind of silly sitting there on top of the dresser. I’ve already re-purposed them as well, and I’ll share those later this week too. But for today, let’s just talk about the dresser itself. 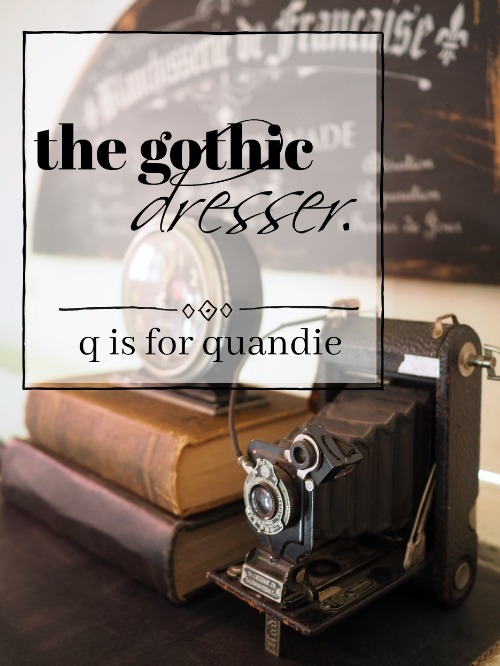 I’m calling it the gothic dresser, although technically I don’t think this dresser is ornate enough to qualify as ‘gothic’. It has a kind of gothic vibe though. Do any of you know what this style might be called? I love those tear drop drawer pulls. Even though one had fallen off, it was included with the dresser so they were all there. 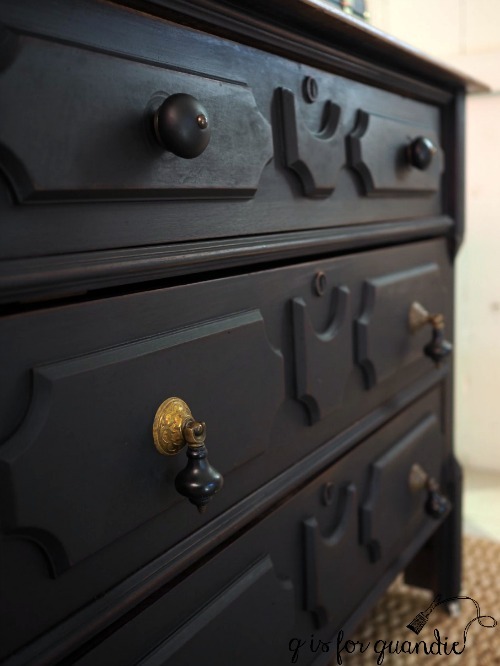 They were the reason I chose to paint the body of the dresser in Homestead House’s Coal Black milk paint. Unfortunately, when I went to put the drawer pulls back on after painting I discovered that the one that wasn’t on when I purchased the dresser was damaged beyond use. Argh. That explains why it was just lying in the drawer! Luckily I had just purchased some round black knobs with a matte finish from Hobby Lobby and I think they ended up working well with the tear drop pulls. 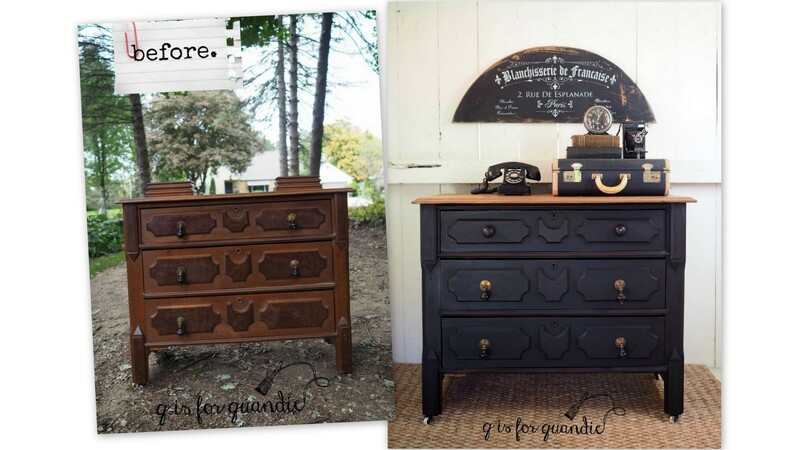 Rather than paint the entire dresser black, I stripped the top and waxed it with Miss Mustard Seed’s Antiquing Wax for contrast. 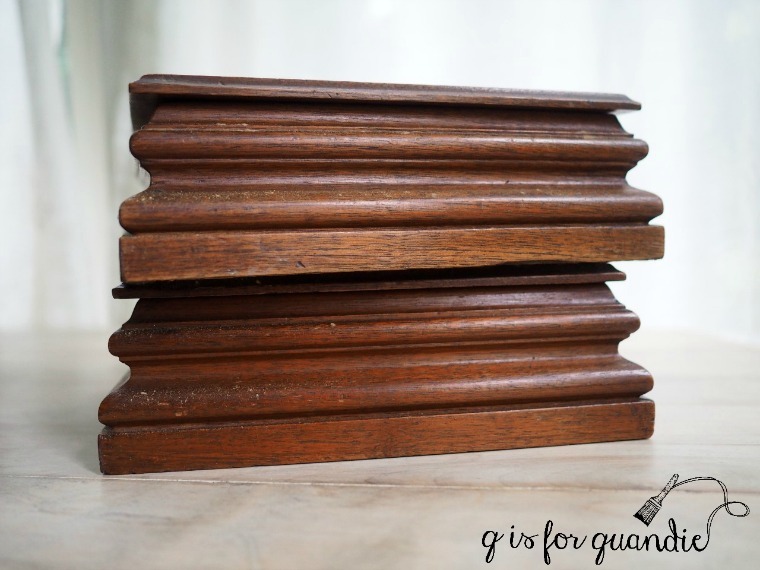 I have been getting a ton of mileage out of that MMS Antiquing Wax lately! 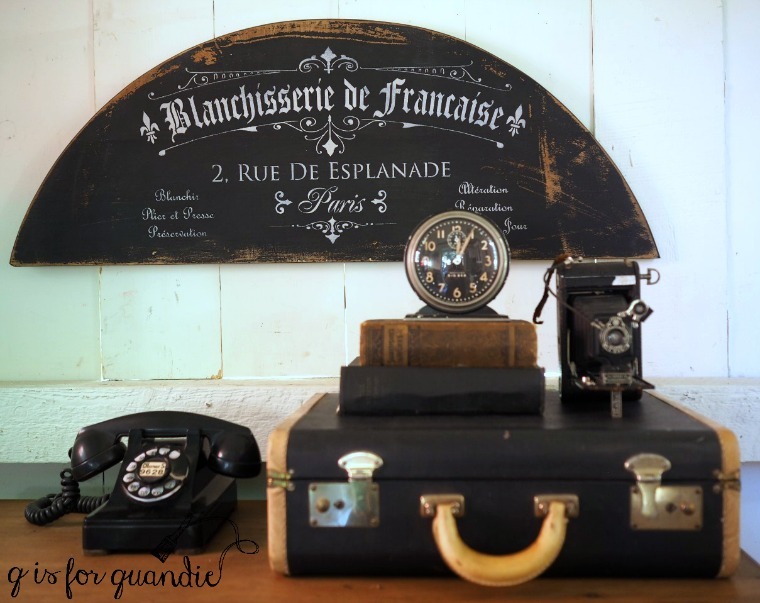 I had so much fun staging this dresser with some of my favorite black props like my vintage phone. And the all black Big Ben from my non-collection of clocks. Since I had some paint left over after painting the dresser itself, I painted the 2nd drop leaf from my green alligator table with it and then added a French stencil. I have to say, I absolutely love how this one turned out. You can be sure there will be more drop leaf signs in my future with this stencil on them. By the way, I added a top coat of Miss Mustard Seed’s hemp oil on both the dresser and the drop leaf sign. I’m so glad I went with the Coal Black on this piece despite the damaged drawer pull, I think it was the perfect choice with the contrast of the wood top. 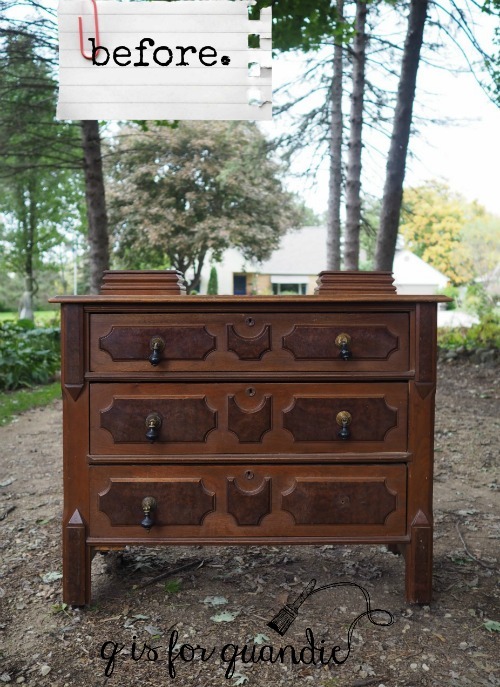 Both the dresser and the sign are available for sale while they last. If you are local, be sure to check my ‘available for local sale’ page for more details. so pretty! did you do multiple coats of the milk paint? do you sand in between coats? Dang! You’ve caught me! I honestly can’t remember if I did a second coat of paint or not. I don’t think I did, and you can often get away with just one coat of the dark milk paint colors. Especially if you’re going to distress the piece anyway. I never sand between coats unless I am doing a chalkboard (you’ll read about that tomorrow). Beautiful as usual. 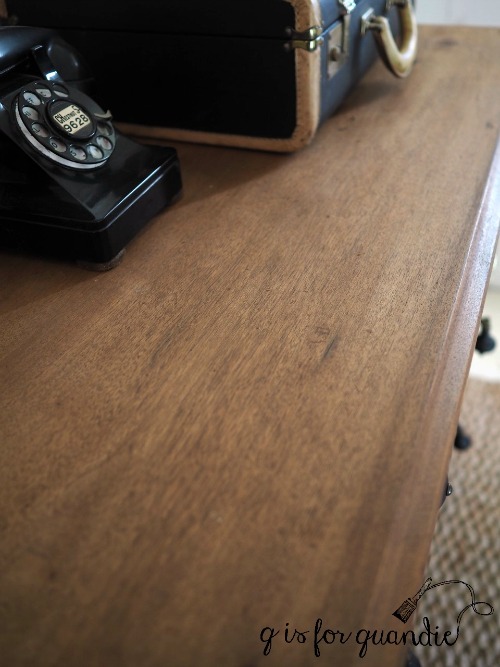 I love a stripped and stained, or in this case, waxed top. And black and brown together make me drool. A lot of people say they don’t go, but I love it! Thanks Maureen! 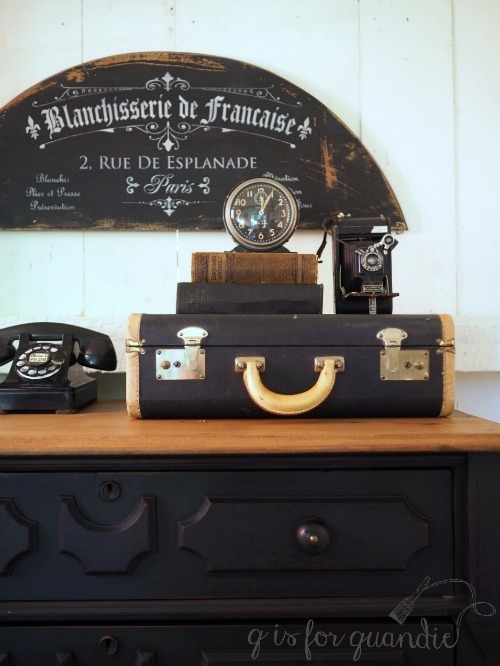 I love the combo of black paint and wood. I’ve done a few others in the past too, you can see my faves here, here and here. Very nice. I always like the natural looking tops. The sign is nice too. Such a beauty…and you styled it so beautifully, too, Linda! Looking forward to seeing what you did with the other parts! Love the black! It will match in any room. I am working on painting a dresser black for our bedroom, but scared of my painting skills so keep delaying. I do love the versatility of black. And really it is one of the easier colors to work with. 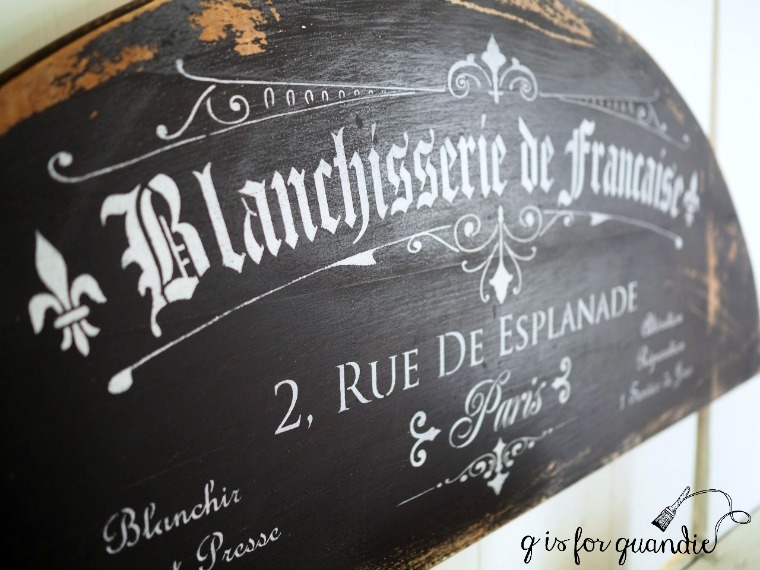 Especially in milk paint! I’ll send you an email with the details Katherine. Love the whole thing. Thanks for the tip. Now I know what to do with those 1 pieces I have from a drop leaf. Can you tell me where you got that particular stencil? Love it. I got it from a vendor on Etsy called Drexart, however, their Etsy shop is closed. Unfortunately, I haven’t been able to find another source for this particular stencil. But check Etsy, you can find lots of great stencils there. 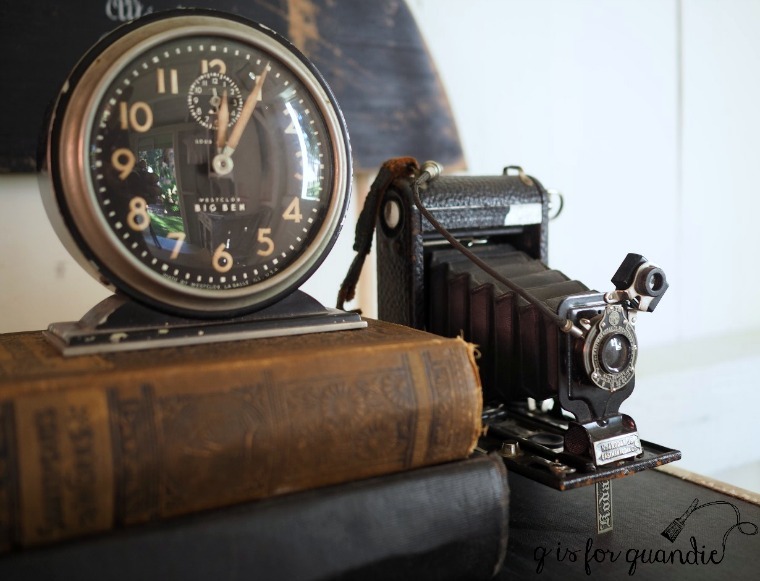 Love your blog and work! 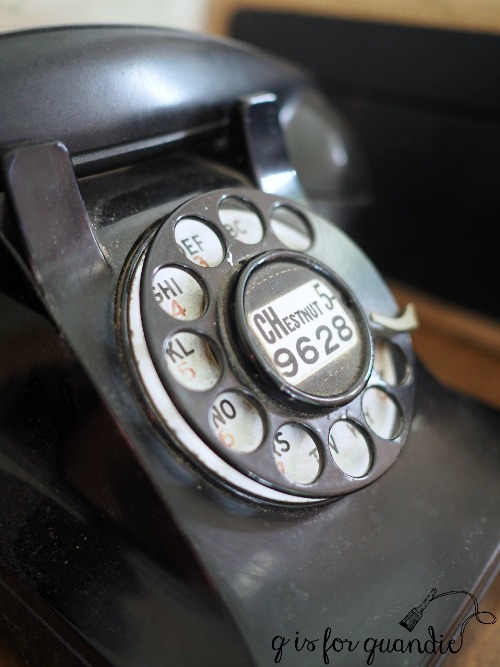 You have mastered the art of simplicity without sacrificing anything! I really like the dresser, but I really love the sign! I love all the black props used for staging. You always amaze me with your vision. Hanky drawers? I guess they were replaced by Kleenex boxes. Thank God we don’t have to wash and iron Kleenexes. Your dresser turned out beautiful. Ironing my dad’s hankies used to be my job when I was a kid. Now the very idea of pressed hankies seems ridiculous! You never know, you may want to remove those hanky drawers to make your dresser more versatile. I’ve sent you an email about the sign, keep an eye out for it! LOVE the stencil you used, wondering whether you made it yourself or would you share where you purchased it? Love both transformations, the black is perfect and I learned about handkerchief drawers which I had absolutely no idea even exsisted. That is one of my favorite stencils. I ordered it from Drexart on Etsy, but unfortunately that Etsy shop seems to be closed now. Drat, right?! 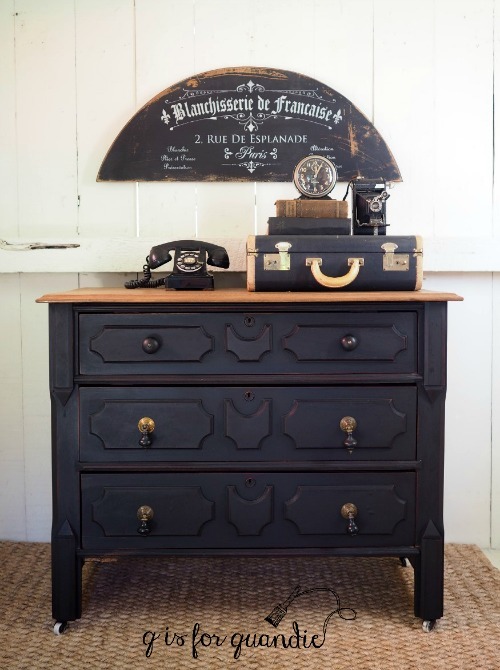 Very handsome piece – I adore black painted pieces. I also love the hardware and those matte HL knobs are the perfect companion to the teardrop ones. Thanks Victoria! It was lucky I had those matte knobs on hand!